In November 2015, old stocks of DDT were repacked at At-Bashy anti-plague station in Kyrgyzstan. These activities were implemented as a joint effort within the GEF funded UNEP project Demonstrating and Scaling Up Sustainable Alternatives to DDT for the Control of Vector Borne Diseases in Southern Caucasus (Georgia, Kyrgyzstan, Tajikistan) (DDT-project) and the EC FAO partnership project Improving capacities to eliminate and prevent recurrence of obsolete pesticides as a model for tackling unused hazardous chemicals in the former Soviet Union. The U.K. based company Veolia Field Services repacked more than 13 tonnes of DDT at anti plague station At-Bashy in Kyrgyzstan. The DDT was buried in bags and was excavated by Veolia using a local repackaging team from the Ministry of Health. The safeguarding activities at At-Bashy had been planned as follow-up to previous emergency repackaging of more than 17 tonnes of DDT. Upon request by the Kyrgyz Ministry of Health, the DDT-project undertook emergency safeguarding at the At-Bashy anti-plague station in Kyrgyzstan in December 2013. At this site the store roof was in bad condition and it was feared that during winter the roof might collapse, thus destroying the DDT bags and mix the chemical with the rubble from the destroyed building. 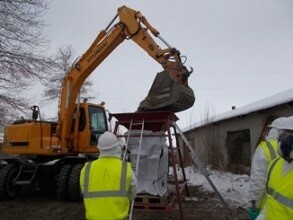 In total, 17 tonnes of bags with 10 % powdered DDT was repacked and stored in a shipping container at the site. The 13 tonnes excavated in November 2015 were placed in a shipping container as well. Besides finalising repackaging at At-Bashy, Veolia also started safeguarding obsolete pesticides stocks at a high risk site at Balakchy (near Issyk-Kul lake). Before the start of repackaging, Veolia trained a repackaging team consisting of staff from the Ministry of Agriculture, Environmental Agency and Ministry of Health. Project partners Green Cross Switzerland and Milieukontakt International additionally organised a training on Monitoring and Supervision of Safeguarding for the same ministries and agencies as well as for staff from the Kyrgyz Environmental Inspection. It is expected that the remaining stocks of obsolete pesticides at Balakchy will be repacked in January and February 2016. The stocks at Balakchy will also be stored in shipping containers, until a central storage for obsolete pesticides will be built the country or options for local disposal or disposal abroad in licensed facilities will become available. In the Dutch national newspaper “De Volkskrant” an interesting interview with Milieukontakt’s chairman Bram de Borst was published. He tells among other things about a succesful project implemented in Kyrgyzstan in the last year, whereby Milieukontakt organised for the covering, fencing and guarding of an obsolete pesticides’ dumpsite that posed a great risk to human health and the environment. To read the article in ‘De Volkskrant” (in Dutch), click on the link below. Stocks of obsolete pesticides pose a threat to public health and the environmental in Kyrgyzstan. Exposure to the Persistent Organic Pollutants (POPs), that many of these stocks contain, can lead to serious health effects including cancer, birth defects, dysfunctional immune and reproductive systems and diminished intelligence. Unusable stocks piled up in Soviet-time Kyrgyzstan due to over- ambitious planning and mismanagement of pesticides. As a signatory to the Stockholm Convention, Kyrgyzstan aims to eliminate the obsolete stocks and reduce the release of POPs into the environment. Large international projects will be needed to organise and finance the final disposal of the stocks and it will take time to find enough support to develop and really implement these projects. Today, however, the health and environmental risks remain urgent and somthing needs to be done. The burial site in Jalal Abad province for instance is one of the Kyrgyz hot-spots that need direct intervention. The fencing material that once isolated the site from its surrounding has been taken away by locals and illegal “waste miners” come to the burial site and dig out the pesticides, in order to sell these on the local market as Dust (DDT). They spill the pesticides and pollution of the soil has been observed as a consequence of these activities. Another problem is local herds of sheep and cattle passing by the site. Two years ago 98 people fell ill and 35 were hospitalised after the consumption of the meat of poisoned cows that reportedly drank standing water from pits on the site. This year a herd of 130 sheep died after drinking from the same pits. An international coalition of NGOs and the Dutch Engineering Company Tauw received funding to lower the short term risks of the Jalal Abad burial site with cost effective and low tech measures to protect the environment and groups at risk from villages close to the site. Milieukontakt International , Tauw, Green Cross Switzerland, together with the Kyrgyz NGOs Ekois and Green Light joined forces for risk reducing remediation of the site. Awareness raising activities and a social medical intervention to support the village of the people who were poisoned will play an important role. The initiative is financed by the GEF Small Grants Programme for Kyrgyzstan, Green Cross Switzerland, OSCE and the Milieukontakt Private Donations Fund. During a first mission in July it turned out that there is strong commitment to solve the health and environmental problems from the burial site in Jalal Abad Oblast. A Memorandum of Understanding, designed as a Go / No Go decision making instrument to measure the commitment of local government, was signed by all relevant stakeholders even before the mission. Moreover, the first steps of technical implementation were already taken. Recently a new fence was build around the site (see the picture above.) These early results give a good perspective for further project implementation and high hopes that the project results will be reached in efficient cooperation with local government and NGOs. From 17 to 20 September, FAO will hold a training on development of environmental management plans for environmentally sound management of obsolete pesticides in Tbilisi, Georgia. The training will be immediately followed by a meeting of the Programme Technical Committee (PTC) to assess progress in implementation and to start preparations for the second annual Steering Committee meeting to be held in Kiev November 11 and 12. The training and PTC meeting will be attended by representatives from Armenia, Azerbaijan, Belarus, Georgia, Kazakhstan, Kyrgyzstan, Moldova, Tajikistan, and Ukraine as well as representatives of programme partners including Milieukontakt International, Green Cross, and IHPA. The participation of representatives from Georgia, Kyrgyzstan and Tajikistan will be supported by the UNEP project “Demonstrating and Scaling-up of Sustainable Alternatives to DDT in Vector Management Global Programme”. Both projects aim to reduce the risk from obsolete pesticides on public health and the environment in the former Soviet Union. A consortium of Tauw, Witteveen+Bos, Milieukontakt and Armenian Women for Health and Healthy Environment (AWHHE) is selected by the Organisation for Security and Co-operation in Europe (OSCE) to conduct a site assessment and feasibility study of the Persistent Organic Pollutants (POPs), pesticide burial site Nubarashen in Armenia. The Nubarashen Burial site was built in the mid 1970s as a disposal site for POPs, obsolete pesticides and other chemicals. The burial site is located on the south east side of Yerevan in a valley subject to severe erosion processes. A small village comprising of summer cottages is located around four kilometres down the slope from the burial site. Other villages are located in the area at some greater distance to the burial site. In 2010 OSCE and FAO experts, assisting the Ministry of Emergency Situations, concluded that emergency measures had to be taken as the complete cover of the burial site had been removed and there was a direct risk of the spread of pesticides waste via surface water and by air. Recently the site was capped with clay and the area was fenced. The Ministry of Emergency Situations also installed permanent site guards. The consortium will investigate the site and carry out feasibility study to support the selection of a long term solution for the elimination of risks for the POPs pesticides waste at the burial site. Special attention will be paid to assess health risks for vulnerable groups living close Nubarashen.